A beautiful day for a paint-out! The group I'm in which paints on Fridays (the Plein Aires!) met at Eaton Canyon last week. This was my third time painting there. 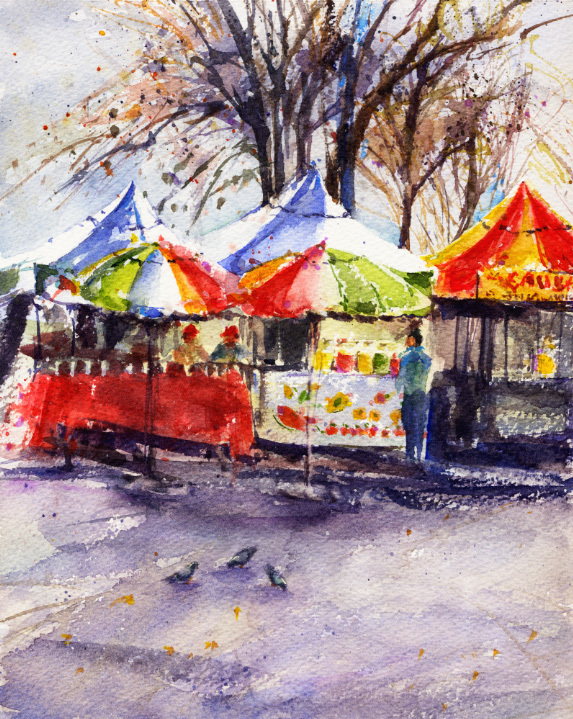 My first visit was when I had less plein air experience than I do now. The watercolor didn't go well. 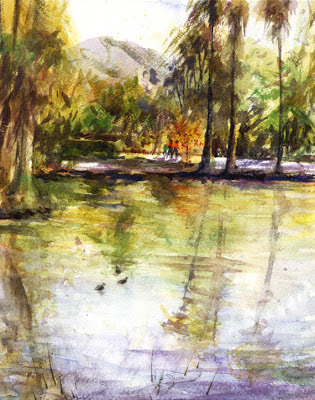 My second piece last spring was an improvement, pictured in my post in August 2012 "Eaton Canyon". Eaton Canyon is a natural area and nature park that draws a lot of people. The wildflowers were barely starting to bloom, just some yellow daisies starting to flower. Since I thought I would see mostly greenery, I decided to try gouache again. It's an opaque watercolor and I'm still experimenting with it. I can put some light colors over darks with gouache which I can't do with transparent watercolor. It's making me think differently so it's been a challenge to try. Two fun pieces here, both 5x7". But another park is a good thing! I've mentioned before how much I'm enjoying all the new-to-me locations chosen for the paint-outs. So many beautiful spots for plein air paint-outs which are just a short drive away. And of course my artist painting friends are terrific. I've driven by Memorial Park in Pasadena many times, and only remember being there for an arts and crafts fair a long time ago. And the only thing I remember about that is two pug dogs dressed in costumes. It was another beautiful morning for painting. This park is hilly, has a neat amphitheater, and various memorials. I'll include a photo below of a prominent Civil War memorial statue. There are good street views for painting around the park as well. 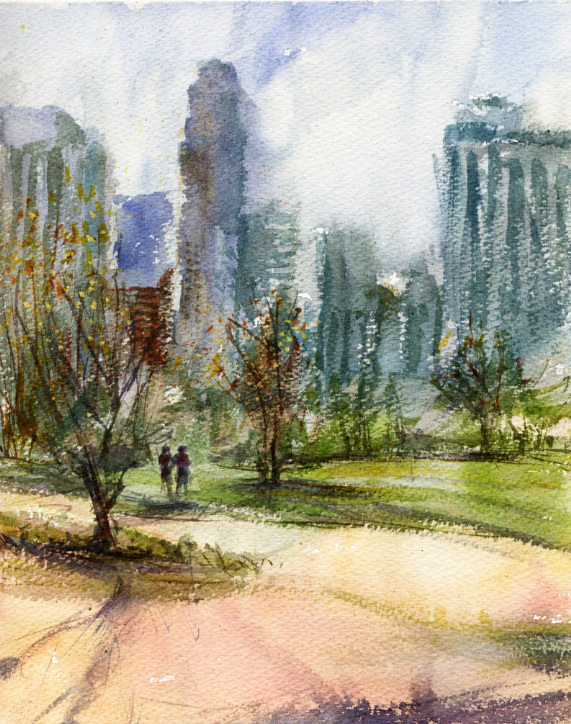 I tried to choose some of the park and also some of the street scene for my watercolor. There were a lot of dogs out for a walk that morning but none in costume. Well yes, another plein air paint-out at a museum! Last Friday we met at the Pasadena Museum of History. The museum is housed in the landmark 1906 Fenyes Mansion. The grounds surrounding the mansion are beautiful. The day we were there, the sunlight through the mature trees was gorgeous. While looking around for a view to paint I happened on a bridal photo shoot. I didn't ask if it was for something commercial or students working on a project. The "bride" was beautiful in a vintage hair style and dress, and pink sneakers I noticed. The architecture of the mansion has so many arches and curves that I didn't feel it was a good subject for me that day. Next door was a smaller house I chose instead. 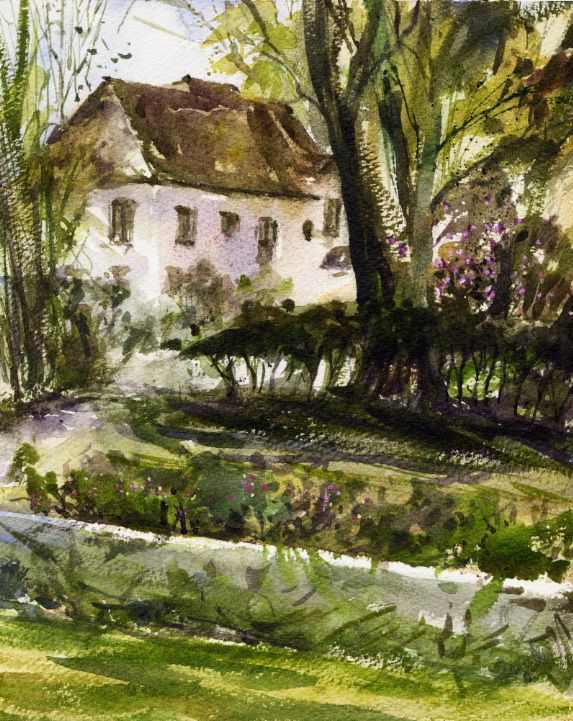 My photo below of the mansion was taken from about where I was painting my watercolor of the smaller building, but looking north. There were two pretty fountains as well. Maybe next time! 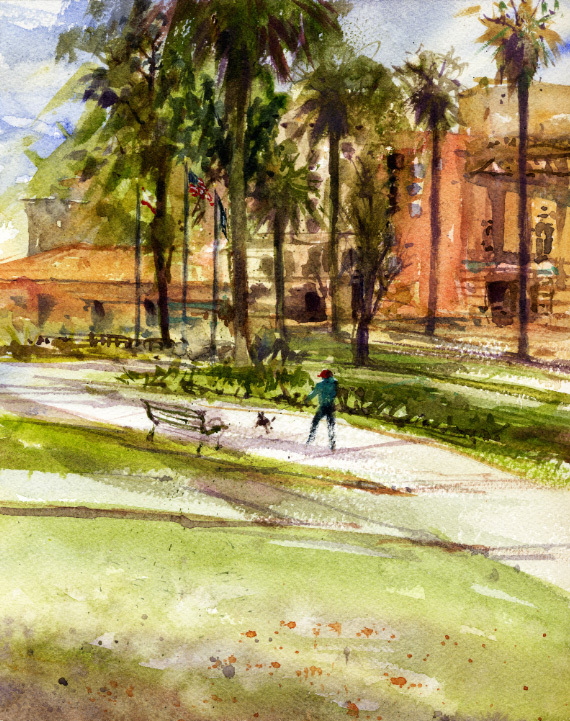 The Saturday group of plein air painters recently met at the Autry Museum in Los Angeles. The museum is located in Griffith Park, next to a golf course and across from the zoo. A busy place on Saturday morning. At the museum it was the opening day of a new art show, Masters of the American West. An adult fitness "boot camp" had their activities set up on the big lawn. There is also a farmer's market on Saturday mornings. I wanted to check out the farmer's market since I hadn't seen it. The market had a nice selection of produce and also some live music. One seller's veggies, in my photo below, were really beautiful. I don't think of painting carrots and radishes too often but I'd like to try it sometime. There were also quite a few sellers of pre-made foods, and also many foods to buy there to eat at nearby tables. Since the museum building didn't appeal to me for a watercolor, I decided to try painting a bit of the farmer's market. I sat on an out-of-the-way curb to paint some colorful umbrellas and the pretty aguas frescas containers, a popular street food combination of fruit blended with water and sugar. Our group had some crepes for lunch after painting and I bought some hot sauce. A nice way to spend the morning! A recent group plein air paint-out was at the Church of Our Savior in San Gabriel. The church was completed in 1874 and the surrounding buildings and gardens are lovely. The owner of the Rancho San Pascual where the church was built was the grandfather of the famous WWII general George Patton. General Patton grew up attending the church. There is a life-size bronze statue of the army commander on the church grounds. Some artists chose the statue to paint. It was a nice sunny day and there was a big turnout of painters. The church has a tall and dramatic bell tower. The changing shadows on it, the surrounding eucalyptus trees, as well as the leaded glass windows, looked complicated to paint that morning. I chose a small picturesque gate cottage to try. In my last photo of part of the group during the critique, you can see the church building in the background. Maybe I'll try painting it next time. The Virtual Paintout - The Isle of Man! I'm enjoying participating in the monthly Virtual Paintout, it's just for fun. I'm late posting my two pieces again which I painted for the January 2013 location. It was The Isle of Man, another place I probably will never see in person. Bill Guffey created The Virtual Paintout and chooses each month's location. Artists use Google Street View to "drive" and "walk" around the month's location looking for their painting subject. The URL from the view we chose to paint is submitted to Bill with our artwork. Bill posts all of the submissions on his blog and on Facebook along with the artist's blog or website links. It's really interesting to see what people found to paint, and all of the different styles of drawing and painting. 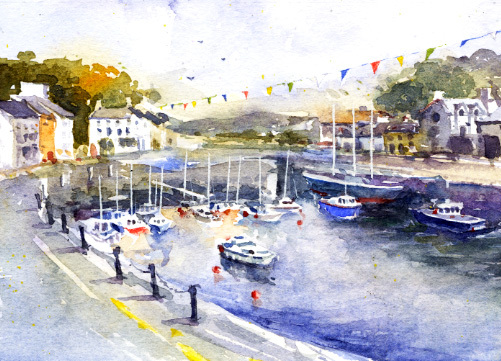 For my visit to the Isle of Man I chose a colorful harbor scene which I painted in transparent watercolor. I also like to try gouache for this fun project and chose a really bright and colorful street scene. 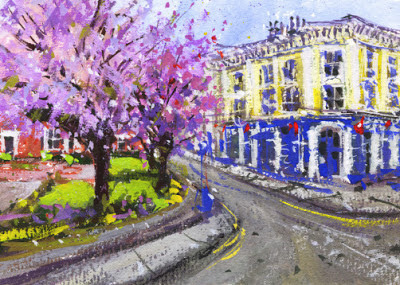 The buildings and flowering trees were so bright that they really caught my eye. I thought such bright colors would be difficult to accomplish with transparent watercolor. These are both 5x7". 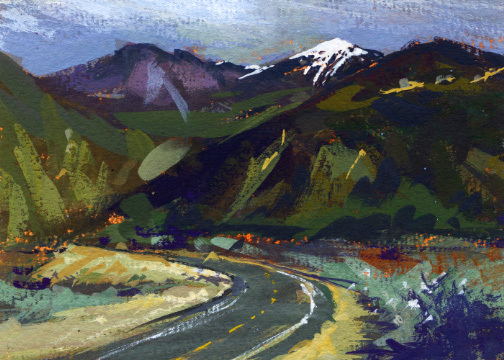 It might be fun to try a plein air painting in the snow! Or at least a painting OF the snow. Less than an hour's drive from Pasadena is Mt. Baldy, officially Mount San Antonio.. It's over 10,000 feet, the highest peak in the San Gabriel Mountains, and has snow to paint in the winter. Mt. Baldy was on the tentative paint-out schedule, but we weren't up to the challenge when the day came around. Coincidentally, another plein air group had scheduled to paint at Lario Park the following week. I posted about my first watercolor there last year in "Lario Park". It's actually not so much a park as a parking lot for the San Gabriel River Trail which many cyclists use. And from there are beautiful vistas of the mountains. The day we were at Lario, we had nice weather and great views of a snow covered Mt. Baldy. 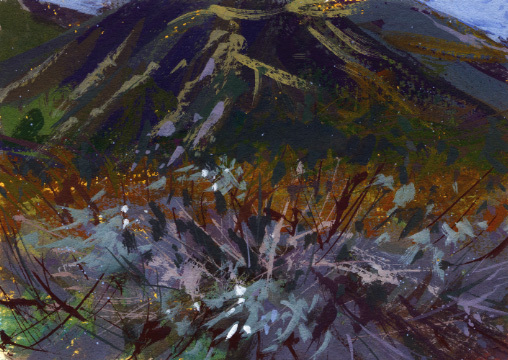 I brought my gouache set-up that day since I've been enjoying trying the new-to-me medium for landscapes without structures. I had in mind to limit brushstrokes so I painted two 5x7" pieces and started both with an under-painting which was a first try for me. I painted some snow after all...from a distance! The plein air paint-out location on a recent Saturday was another park I had not seen before. I'm learning about so many new and picturesque spots because of painting outdoors. We met at Vista Hermosa Park which is at the outskirts of downtown Los Angeles. The weather report mentioned showers and the streets were wet in the morning. The big gray clouds were moving though quickly and things were looking up for painting. I thought if it was too misty for watercolor painting at least I could take some photos. Of course Vista Hermosa means Beautiful View in Spanish. In order to have the beautiful view, the park is very hilly. The trails were pretty muddy but we had to see the view from the upper lawns. I found really wonderful views of downtown, a serene pond reflecting clouds, and it wasn't too damp to paint. I enjoyed painting this piece and tried to just indicate the buildings through the clouds as they came and went. The park was quiet that morning and the next showers held off until we were finished. It was another beautiful day to paint at the Arboretum. My second recent visit there for painting. 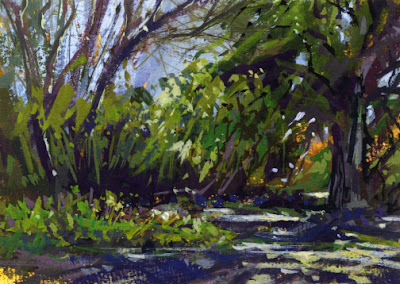 Last month I posted my first plein air piece painted at that location in "The Arboretum". 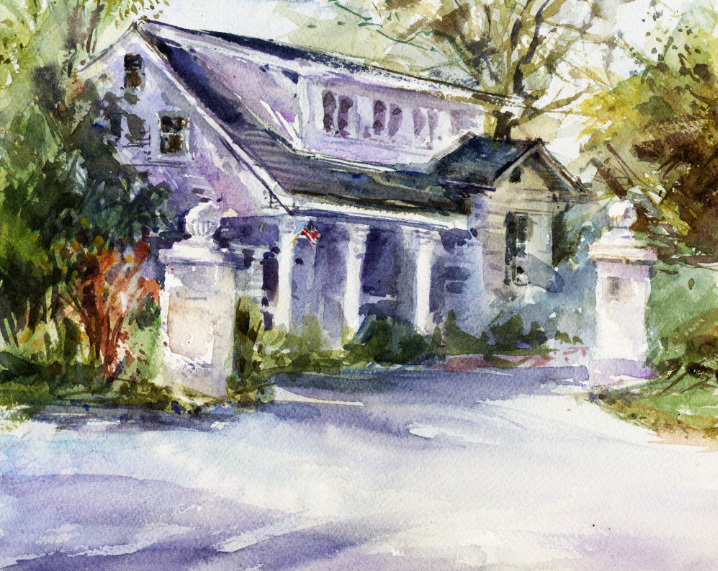 Baldwin Lake borders three sides of Lucky Baldwin's Queen Anne Cottage. The lake and cottage were used as the mysterious island location for the old TV program Fantasy Island. I wanted to paint a view across the lake on my first visit but it seemed I couldn't get to the side I wanted to check out. 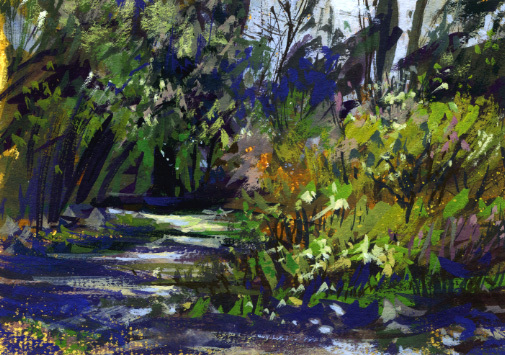 Walking around the lake through the "jungle" seemed endless and I had to chose a view and start painting. This time I took one of the main roads and found the south side of the lake. While I painted I had a lot of company from squirrels and water fowl. Below my painting I've added photos of a few of the variety of birds there. The two wood ducks hung around my painting spot for awhile, avoiding the mallards. Lots of visiting Canada geese were preening by the main fountain. The peacocks of course were right by the entrance to greet visitors.